HEALDSBURG, Calif. (August, 2010) – h2hotel, a progressively-designed inn located just off the historic town plaza in Healdsburg, opened in July and was built to LEED (Leadership in Energy and Environmental Design) specifications aspiring to be the first Gold LEED certified hotel in Sonoma County. Charged with creating a fresh, vivacious property that caters to active users, architect David Baker set out to create a hip, casual and comfortable retreat that charms guests with understated, pragmatic luxury and an unstinting commitment to environmentally-friendly design. 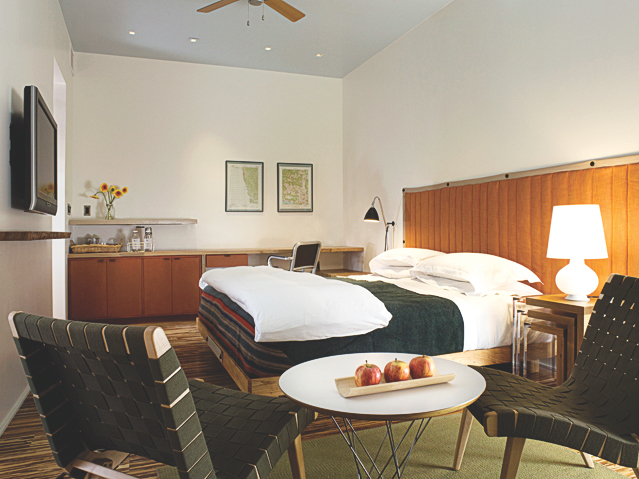 Reflecting Healdsburg’s relaxed Wine Country ambience and gentle rusticity, the hotel will convey straightforward simplicity with a sophisticated sense of space and style. A collaboration among David Baker + Partners, the architect responsible for the AIA design award-winning Hotel Healdsburg, Andrea Cochran Landscape Architecture, and Marie Fisher Interior Design, h2hotel thoughtfully incorporates an eco-conscious sensibility into every aspect of its design, operation, and attitude. Led by Baker, this dynamic team presents innovative design features such as a broad glass entryway that draw guests into the lobby lounge; an undulating green roof that filters and lessens the impact of rainwater runoff on the adjacent Foss Creek and is a new landmark signaling arrival to downtown Healdsburg; and an all-in-one “Receptobar” that serves as a front desk, mini-bar stocking station and entertainment counter as well as an intimate coffee and wine bar that provides counter seating in the evening for the hotel’s restaurant, Spoonbar. h2hotel is built on a relatively small footprint, rising four stories with 36 guestrooms. The façade of the building features local Forest Stewardship Council (FSC) certified redwood slat screens, which function as shading devices, and waterjet cut-patterned Corten steel railings on private balconies that overlook the gentle bustle of Healdsburg Avenue or the peaceful courtyard. Activating the entry courtyard are concrete columns studded with vine pockets, custom bike racks made of bent Corten pipe and the remarkable “Spoonfall” water sculpture sustained by an underground cistern replenished by natural rainfall. Created by internationally recognized Sonoma-based public artist Ned Khan, “Spoonfall” brilliantly features thousands of espresso spoons sending water droplets down in a joyful cascade. At the rear of the property lie the hotel’s solar-heated outdoor swimming pool and a 10,000-square-foot native meadow flanking Foss Creek, which runs through the length of the town. Going beyond the walls of the hotel and the mandates of a LEED certification, h2hotel is restoring Foss Creek with a native planting project in partnership with the Riverkeepers and Trout Unlimited organizations. The environmentally-sensitive interior design by San Francisco-based Marie Fisher Interior Design in association with Jennifer Gadiel combines sleek finishes with natural materials and furnishings. Soft earthy tones and ample light enhance the open, airy feeling created by 11-foot ceilings in all guest rooms. Many of the custom furnishings are unique designs, including bed frames and cabinetry fabricated from Evan Shiveley reclaimed woods such as American elm, acacia, and black walnut. All textiles, including chemical-free, fair trade Peace Industry felt rugs and 100% organic cotton linens, are loomed from all-natural fibers. Guest rooms also feature tiger-striped sustainable bamboo flooring and locally-sourced Heath Ceramics creamy white tiles in the bathrooms. To create a handsome and restful retreat, the simple and functional rooms are adorned with reversible orange/persimmon fabric-padded headboards, teal wool Camp blankets with striped edges, live-edge reclaimed American elm shelves and lounge chairs by Jens Risom for Knoll upholstered with forest green cotton webbing. Custom-made water (h2O) bars serving purified sparkling and still water are located on each floor for guests to fill glass water carafes offered in the rooms. A bright and open ground-floor lobby lounge, divided by the multi-functional “Receptobar,” welcomes guests with soaring ceilings, aqueous blue-green hues and unadorned concrete floors. On the street side of the lobby is Spoonbar, the hotel’s hip and casual 60-seat restaurant, featuring a rough-hewn communal dining table, reclaimed wood table tops, apple green Eames fiberglass chairs and blue Eames “Case Study” chairs. On the creek side of the lobby is a welcoming “chill space” in which guests can relax on low and colorful Roche Bobois Mah Jong couches in front of a fire box fabricated by San Francisco-based Sand Studios and built into airy steel bookshelves overlooking the garden pool area. Hotel guests will enjoy stunning art throughout the property. Curated by Svea Lin Vezzone of Oakland, California-based Swarm Gallery, h2hotel’s art program highlights original art from Bay Area artists that takes on an environmental and sometimes edgy slant. This emphasis comes through in such elements as the use of environmentally-conscious materials and concepts. Large, original pieces and art furnishings are displayed on the ground floor, and additional works are visible in gallery spaces on the hotel’s upper levels. 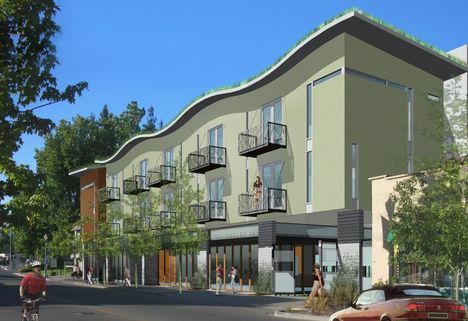 h2hotel is located at 219 Healdsburg Avenue between Mill and Matheson Streets just off the historic town plaza in Healdsburg. Visit h2hotel on the Web at www.h2hotel.com.